In the lab, the 5128A calibrates humidity probes 33% faster than a two-pressure generator. In the field, the 5128A provides more thorough, reliable multi-point calibrations than one-point spot checks using handheld humidity meters. The 5128A comes standard with an ISO 17025 accredited system calibration. Support offerings include online chat, email, phone, and product service from Fluke Calibration, channel partners and authorized service centers around the world. The 5128A RHapid-Cal® offers a best-in-class humidity system accuracy of ± 1.0 % RH (7 to 80% RH, 18 °C to 28 °C) which includes all known sources of error such as stability, uniformity, drift, and calibration uncertainty. Calibrate with confidence using an instrument with comprehensive specifications. Most competing generators don’t specify system accuracy. Their specifications can be complicated and confusing, making it difficult to know how to apply them to a particular calibration process. The 5128A also provides the flexibility to improve calibration uncertainty by using an external humidity reference such as a chilled mirror hygrometer. The materials and air flow design used in the 5128A RHapid-Cal® are selected to ensure that response time to a humidity or temperature step change is fast. Rate of change for temperature increase is typically 10 °C/minute and for temperature decrease is 1.5 °C/minute. Rate of change for humidity increase is typically 10% RH/minute and for humidity decrease is 5% RH/minute. A typical six-point calibration can be done in two hours using the 5128A RHapid-Cal®. In contrast, a two-pressure humidity generator takes longer to respond to humidity or temperature changes. A similar six-point calibration with a typical two-pressure generator would take more than three hours. Spot-check or one-point probe calibration using a handheld humidity meter in the field is convenient, but limited in value. Calibration with a handheld meter needs to be carefully managed. Temperature differences between the probe and its environment, technician body heat, and moisture from breath can all cause RH measurement errors. Further, one-point tests may cause out-of-tolerance readings when ambient conditions change. Using the 5128A RHapid-Cal® for a multi-point calibration gives a more reliable test and truer characterization of how a humidity probe actually operates over its working range in the field. 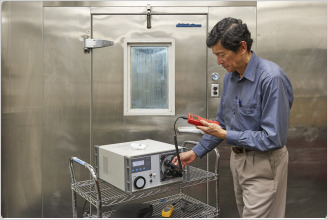 A large variety of humidity sensors can be accommodated in the 5128A test chamber. The 5128A comes with a five-port door for calibrating up to five RH probes, meters, and transmitters at a time. An optional transparent door with a shelf is available. 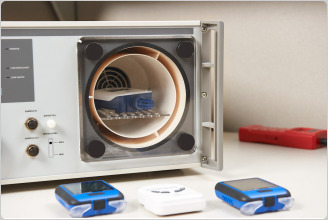 Data loggers are placed on the shelf inside the chamber for calibration. The mixing insert can be removed to accommodate larger devices in the chamber. The 5128A RHapid-Cal® measures 237 mm high x 432 mm wide x 521 mm deep (9.3 in x 17 in x 20.5 in) and weighs just 15 kg (33.06 lbs). It can be easily carried to any desired bench space in the lab or transported on-site to a field work location. Its front-loading internal desiccant cartridge design adds convenience and ruggedness. 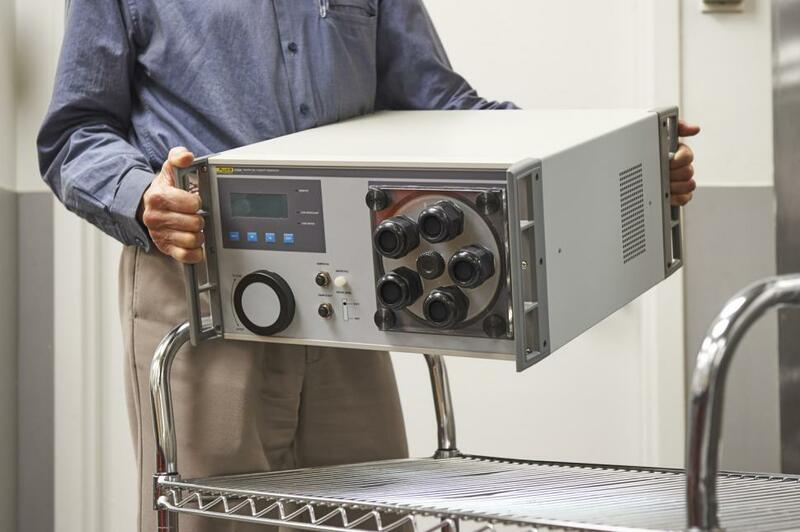 In comparison, a two-pressure humidity generator is practically limited to laboratory use because of its large size. It includes a generator, compressor, and supporting equipment. A “small” two-pressure generator requires about eight times the space that the 5128A RHapid-Cal® does and weighs about four times as much. The 5128A RHapid-Cal® is easily placed on a small cart for plant-wide transport and a convenient wheeled transport case is offered for shipment or transport to on-site calibrations. 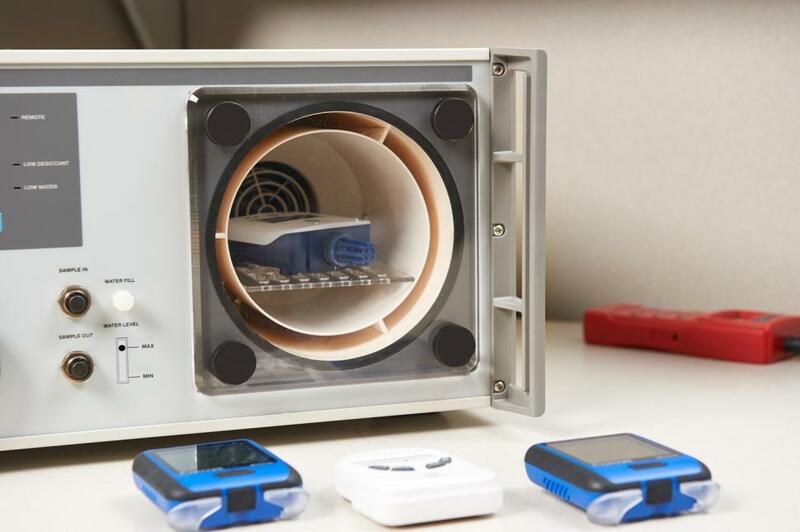 Prior to shipment, each 5128A RHapid-Cal® receives an accredited system calibration by Fluke of the humidity chamber with its internal reference probe, using a chilled mirror hygrometer as the reference standard. This system calibration provides the assurance that the 5128A and its internal reference probe have been optimized for the best performance when they leave the factory. 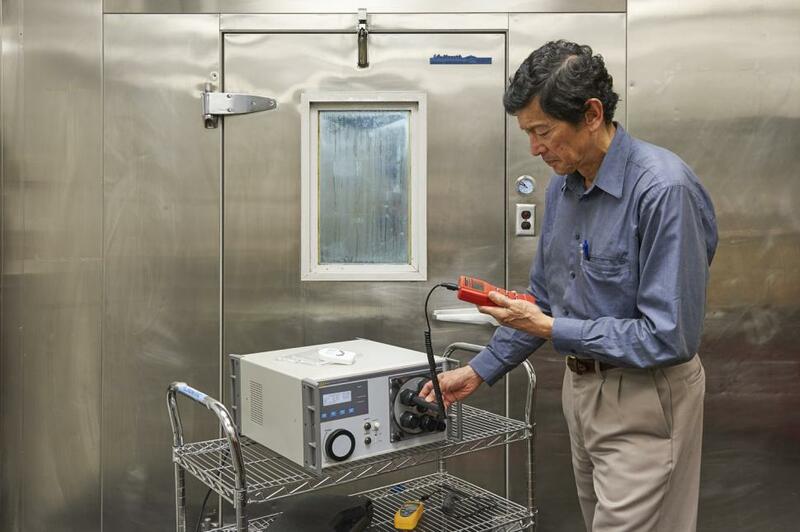 In contrast, some humidity generator suppliers only provide a reference probe calibration, but not a complete system calibration that ensures uniformity and accuracy delivered at the location of your device under test. The 5128A RHapid-Cal® uses a mixed-flow method to generate relative humidity. A desiccant cartridge provides a source of low humidity and an internal humidifier generates high humidity. A display light indicates when the desiccant cartridge needs to be replaced. The 5128A front-loading internal disiccant cartridge design adds convenience and ruggedness. The 5128A front-loading internal desiccant cartridge design adds convenience and ruggedness. The desiccant cartridge can be easily changed by removing the front cap and sliding in a new one. Only clean distilled water is needed to operate the 5128A RHapid-Cal®. Compressed air or other additional fluids are not required. A water level indicator on the front panel shows status of water level in the humidity generator. When the water level falls below the minimum level, use clean distilled water to fill the reservoir. No special shut-down routines are required after use, so you can move on to the next job quickly. 47 CFR 15 subpart B. This product is considered an exempt device per clause 15.103. Note: The displayed dew point reading (DP) is calculated from the Product’s actual temperature and %RH readings. It is calculated as a dew point (water vapor over water) over the entire range, regardless if dew point is equal to or lower than 0°C, and at a nominal pressure of 101.325 kPa (1 atmosphere). The Product specifications describe the Absolute Instrumental Uncertainty of the Product. The Product specifications include stability, ambient temperature, and humidity (within specified limits), linearity, line regulation, the reference standard measurement uncertainty and long term stability of one year. The product specifications are provided at a 99 %, k=2.58, normally distributed level of confidence, unless otherwise noted. 1 For ambient conditions of 23 °C ± 5 °C, multiply the specifications by 1.5. 2 Hmax is the maximum humidity value at which the specification applies. Note: Specifications apply to the Working Volume shown in the Working Volume Template found at the end of the Operators Manual, and is referenced to the “Actual” reading on the Product display. 2 Defined as the uniformity of the Working Volume. 3 Defined as 1-sigma standard deviation of measurement readings over a 5-minute span. 4 Chamber humidity uniformity is listed for mid-level humidity settings. Lower humidity settings will give better uniformity while higher humidity settings will give worse uniformity. 5 The chamber control range is 5 °C to 50 °C. Achievable low temperature may be limited to 15 °C below ambient dependent upon stabilization time and temperature and humidity settings.